2018 Recipient of Tiftickjian Law Firm’s Juvenile Justice Scholarship - Tiftickjian Law Firm, P.C. Tiftickjian Law Firm is proud to announce the winner of our 2018 Juvenile Justice Scholarship. Hope Goodman is a passionate and accomplished young woman who will use the scholarship funds to further her law education. Hope graduated from the University of Maryland, College Park, with honors, having been on the Dean’s list and Distinguished Dean’s List every semester. 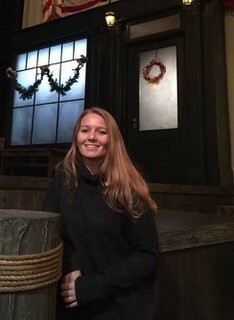 Prior to law school, Hope interned with the Maryland Office of the Public Defender where she saw firsthand the impact that progressive court decisions like Miller v. Alabama (2012) and Montgomery v. Louisiana (2016) can have on youth and juveniles who find themselves incarcerated and looking for a second chance in life. Hope’s observations that not all defendant’s are treated equally and those of color are more adapt to find themselves facing incarceration was an unfortunate reality of the current state of our juvenile justice system. Exposure to the criminal justice system at such a young age and for often very minor offenses, often facilitates premature and unnecessary exposure to the court system which can fuel higher rates of recidivism. “Incarcerating juveniles in facilities with terrible conditions that impede meaningful rehabilitation offers another example of how the system is not functioning as it was intended. These facilities are dangerous and unprepared to address the unique needs of juveniles. They have proven to be ineffective and wasteful by not successfully decreasing recidivism at the same time as removing access to education and employment opportunities. Juveniles, whose psychological and emotional capacities are still developing, often develop mental health problems and suicidal ideations as a result of being placed in solitary confinement or disciplinary segregation. Finally, few life and job skills programs are available to take advantage of,” Hope told us in her essay, which was included as part of her application for the Juvenile Justice Scholarship. We look forward to helping Hope further her legal career where she can help show that rehabilitation is the key to success within the juvenile justice system, not incarceration. Tiftickjian Law Firm created the annual Juvenile Justice Scholarship to help law students, like Hope, further their education. The scholarship also helps raise awareness around the state of our criminal justice system as it relates to prison sentences and reduced rights for minors. With this financial support, we intend to make a positive impact in the careers of aspiring legal professionals who pursue justice for our country’s youth.